The Vero Beach Art Club awards four $3500 scholarships to Indian River County high school seniors annually to further their career in the arts. The entries are judged by three examples of their artwork, and letters of reference from their art teacher or art-related mentor. Scholarship applicants may apply as a senior who is graduating from an Indian River High School and accepted to pursue an art related course of study at an accredited higher learning institution. We are proud to announce our 2019 Indian River County Scholarship recipients! This year we gave away 4 $3500.00 and 3 $100 scholarships. These talented artists will be graduating high school this year, have already been accepted into the college of their choice and will be attending an accredited art school, college or university within the year in an art related course of study. Congratulations and a BIG THANK YOU to everyone who applied! You may access the 2019 scholarship application from the button below for informational purposes only. The application period for 2019 has closed. Watch for next year’s application coming soon. The Vero Beach Art Club's mission is to encourage and support both appreciation and creation of fine art with emphasis on painting, drawing, collage and sculpture. 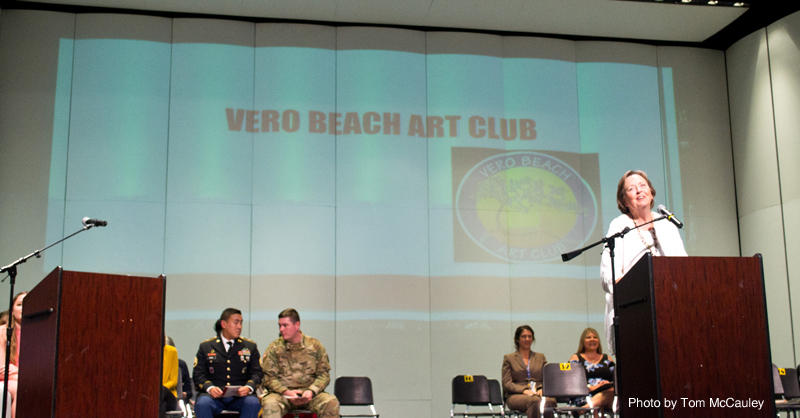 The Vero Beach Art Club is a non-profit organization and receives funding from donations for their education programs, scholarships and school outreach, Arts for Smarts, through their three main exhibitions Art by the Sea, the New Dimension, and Under the Oaks Fine Arts & Crafts Show each year. We are proud to announce our 2018 Indian River County Scholarship recipients! 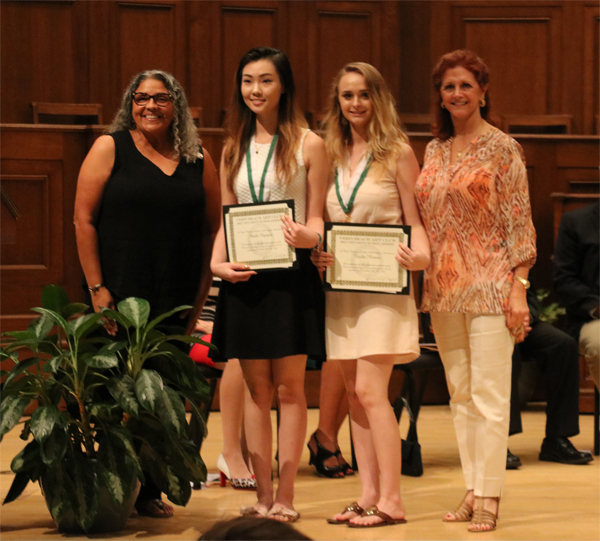 This year we are pleased to award 4 Scholarship to the following very talented Indian River County Graduating Seniors: Maya Lindseth, Julianne Lombardi, Sheila Nguyen, Tasha Reiner. Sheila Nguyen and Tasha Reiner who are graduating from Indian River Charter High School were each presented with a scholarship check for $3000 at Community Church on May 2, 2017. Pictured left to right are: Lizdiel Ramos-Hering Vero Beach Art Club Vice-President, Sheila Nguyen, Tasha Reiner, Rebecca VanCordt Vero Beach Art Club President. Maya Lindseth received her scholarship in the amount of $3000 at our Annual Luncheon/General Meeting held at the Patio on May 4, 2017. Maya is a graduate of Sebastian High School and plans to attend University of Central Florida to study art. Pictured left to right are Rebecca VanCordt President, Alicia Callander Great-Grandmother, Maya Lindseth and Lizdael Ramos-Hering Vice President. Julianne Lombardi received her scholarship in the amount of $3000 at St. Edward's High School on Tuesday, May 23, 2017. She plans to attend the Ringling College of Art and Design to study art. Pictured left to right are: Julianne Lombardi and Rebecca Van Cordt Vero Beach Art Club President.